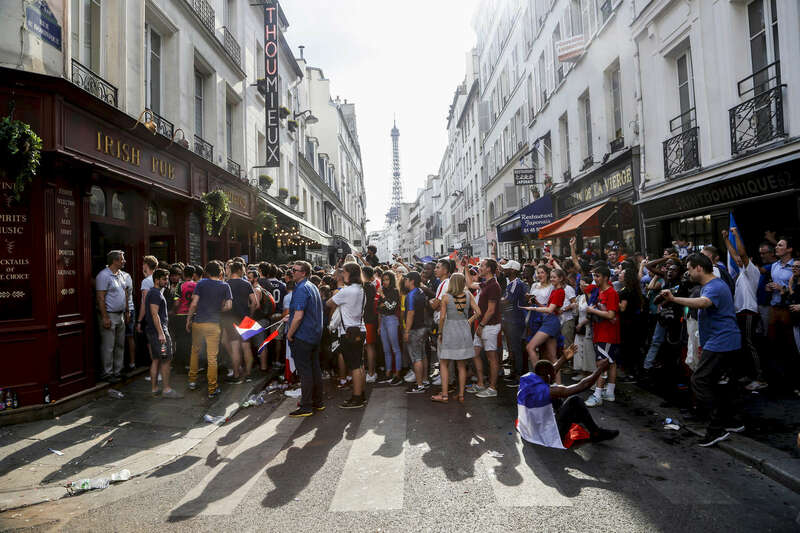 Supporters watch the World Cup Soccer final on the TV of a bar, on July 15, 2018, in Paris France. On the historical Soccer World Cup final between France and Croatia, fans were invited to watch the game on giant screens set up in the Champs de Mars, in front of the Eiffel Tower in Paris. But this Fan Zone was full long before the start of the game, leaving thousand of supporters scrambling to find a place to watch the game close by. The nearby and usually quiet coffees and restaurants were quickly over flooded. But for the next two and a half hours, it did not matter to watch the game from the middle of the streets. Very few cars were circulating, because almost everyone in France was watching, or trying to watch the game.